Swing into spring with this fun and fabulous look, featuring a mesh overlay, floral embroidered detail and comfortable, pull-on waist. If you are short this skirt will go to your ankles. I wish Catos would use plus size models. 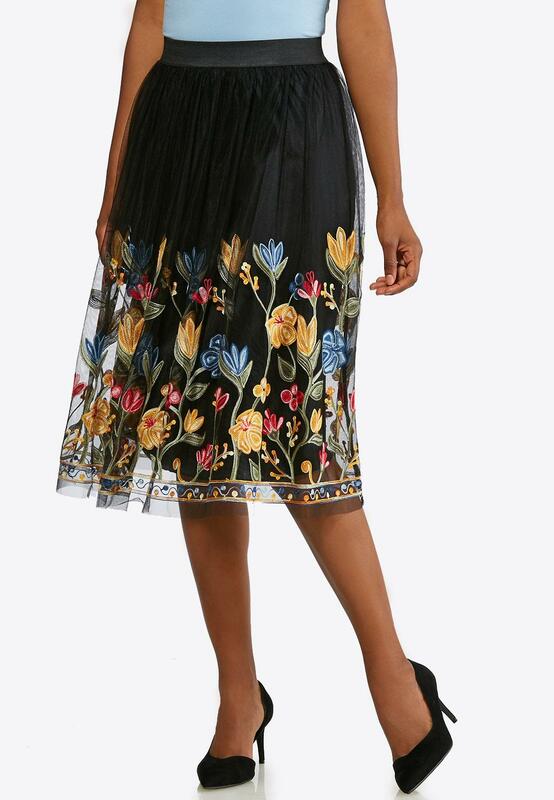 This picture is showing a skinny model that is probably 6foot whick makes the skirt appear to be short. It is still cute and wearable just wish Catos would be more transparent in their sizes etc. This skirt is a good addition for my spring/summer wearing. I got tons of compliments when I wore it. It was an okay length and size. It is true to color and cute for weekend wear, church or out and about. I would recommend it to anyone who likes florals.